The Cycladic style Sea Villas are located in Kamari, just 10 meters from the black sand beach. 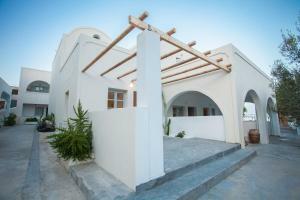 It offers free Wi-Fi in public areas and air-conditioned accommodation with a private balcony. This air-conditioned room features a spacious balcony, an open-plan living area, satellite TV, a small fridge and a safe. This air-conditioned room is elegantly decorated and features a spacious balcony, an open-plan living area, satellite TV, a small fridge and a safe.